Is it time to short stocks? Wow, what a show of strength by the bears! By the end of last week, the blogosphere came alive with buzz about the technical damage done to the major US equity averages. My inner investor is getting more cautious, though my inner trader thinks it may be premature to get aggressively short the stock market. On the surface, the SPX didn't look too bad. It had descended to a major support zone and remained above the 50 days moving average (dma). The 5-day RSI (bottom panel), which is useful for short-term swing trading, showed fading momentum. 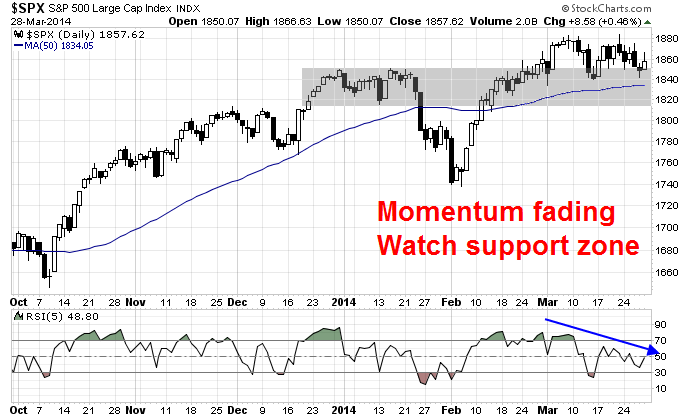 Bulls could be comforted by monitoring how the index would behave in the support zone pictured in the chart below. Market internals, however, revealed a deteriorating picture. In particular, momentum stocks got crushed last week. Such market action is indicative of a reversal in overall risk appetite and flagging price momentum is often a sign of an exhausted bull (see my previous study at Momentum + Bull market = Chocolate + Peanut butter). As an example, the post-IPO performance of King Digital Entertainment, the maker of Candy Crush, was highly disappointing. 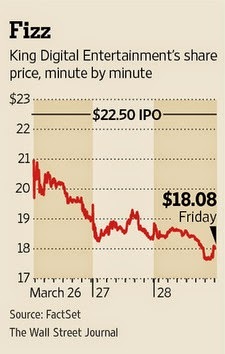 Down 16% on the first day of trading, the shares continued their descent the next two days. The carnage was mirrored in the formerly red hot Biotech stocks. If it is any consolation, bulls can at least point to the fact that the Biotechs were testing a relative uptrend line that began about a year ago. Unfortunately, the same couldn't be said of the NASDAQ Internet Index, which consisted of momentum technology names such as Amazon.com, Google, Facebook, etc. The chart of their relative performance to the SPX showed a violation of the relative uptrend line, with little support beneath current levels. There is a glimmer of hope as the decline could be arrested at one of the pictured Fibonacci retracement levels. The damage was also evident in the NASDAQ Composite. The top panel of the chart below shows that COMPQ had breached its 50 dma and it was testing the the bottom of a support zone. The chart of the relative performance of COMPQ against the SPX is more troubling as it shows that these high-beta stocks had violated a relative uptrend line, which is indicative of declining risk appetite. The chart of the small cap Russell 2000 also shows a similar picture of the violation of the 50 dma and relative uptrend line, as well as a test of the low end of the range of a secondary support zone. The relative performance of the Consumer Discretionary sector against Consumer Staple sector, another measure of risk appetite, reveals a violation of the relative uptrend that began in early March. This pair is now testing the bottom range of a relative support zone. Other measures of risk appetite, such as this chart of the relative performance of the SPX against long Treasuries, tells a similar story. This pair violated a relative uptrend line in January, consolidated sideways and now it is again testing an area of relative support. I could go on about how market internals have deteriorated and risk appetite has waned, but you get the idea. With the bears swarming the equity markets like Russian troops in the Crimea, is it time for aggressive traders to get short this market? My inner trader is whispering, "Not yet." Despite the carnage, stock prices seem to be following the script of a mid-term election closely. 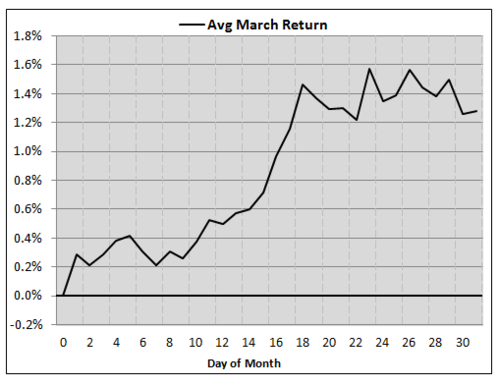 Ryan Detrick tweeted this chart on March 17 and the market seems to be still following the historical pattern of a rally into April/May. 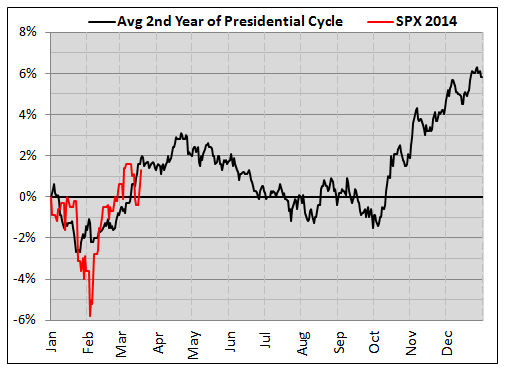 If history is any guide, late March and early April tends to be sloppy and the market stages one final rally in late April before topping out and decline into a final low in October. Given the kind of technical damage that has been done, it's doubtful that stock prices are capable of making a new high in April or May. Bears should consider that high-beta assets are highly oversold and could stage / a counter-trend rally at any time. As well,.the market have experienced numerous breaks of uptrends or relative uptrends. However, trend breaks tend to resolve themselves in a period of sideways consolidation, rather than an immediate trend reversal. Consider this classic example of the relative performance of the NASDAQ 100 against the SPX in the last 15 years. NDX underwent both a relative uptrend and relative downtrend and, in both cases, the relative breakout and breakdown were followed periods of consolidation. Earnings Season is just around the corner and the results could be a wildcard. 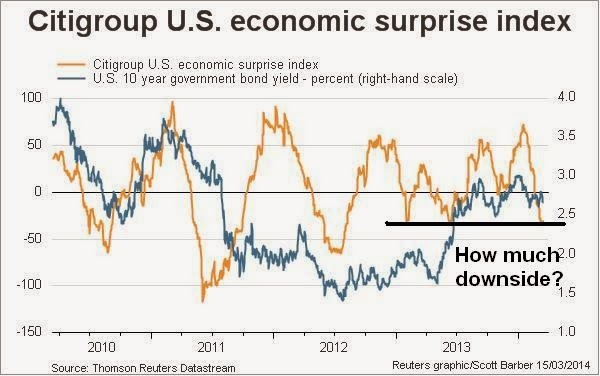 The Citigroup US Economic Surprise Index is near the bottom of its near term range and has started turn up. Such a reversal could translate into better company guidance as we move through Earnings Season, which would be bullish for stocks. The first key test for bulls and bears alike will be the jobs report on Friday. Anyone putting on a major bearish position here would be betting that the Economic Surprise Index continues to deteriorate and growth starts to decelerate to sub-2% levels - a truly non-consensus call. China could announce a new round of stimulus. Right now, there is still considerable disagreement over whether there would be a stimulus program, or whether it would be a "Big Bang" style broad based program or a highly targeted initiative. Regardless, any announcement or perceived move towards a stimulus program, such as a cut in reserve requirements, would likely boost global risk appetite, even if it were perceived to be an "extend and pretend" exercise (see China: Minsky Moment or more stimulus?). Indeed, the market seems to be anticipating some kind of policy response as the New China (consumer) vs. Old China (financials) pair trade has reversed itself in favor of financials, though the relative breakout of New China stocks remains intact (see A New China vs. Old China pair trade).. The vertical lines in the above chart shows the past instances where these signals have been first triggered. In most cases, the signals have been a little late but they have been the precursors of further declines in stock prices. 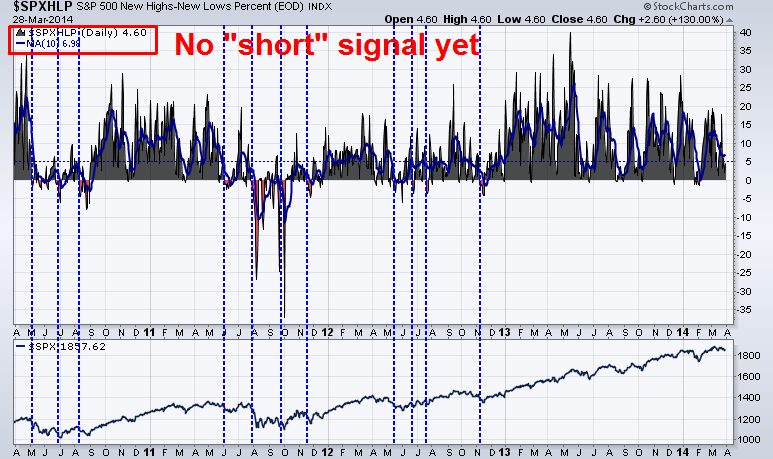 For now, neither the SPXHLP nor its 10 dma are at their bearish trigger points, indicating that it is premature to go short. There are a number of caveats to the use of this model. First and foremost, it has not been tested in real-time and the chart is only based on back-tested performance, so take its output with a grain of salt. As well, the tests show that it is useful on timing the entry point to go short, but it is less useful on exit conditions. I am offering this trading model to my readers for free. Its value is measured by the price paid. Most of all, remember that the signals from this untested model should not be the only trigger for making a trading decision. And that’s the key. I think that economic modelling is very useful. It helps conceptualize important points and gives us a general framework for understanding the world. But we should also be aware of the weaknesses embedded in many of these models because many of these models are simplified to the point that they are misleading. And this stems from another big problem revolving around the way many economists obsess over mathematics. Can I just plug in my numbers and get the answer? That post still gets read once in a while because it serves as a useful reference on the Altman Z score. Then, the other day, I get a question asking if "we (can) use Altman Z score to predict (the) banking industry?" Think about that for a minute, the original Altman Z score assigned weights to different measures of solvency, such as working capital adequacy, EBIT margin, turnover, etc. The weights appeared to have been optimized for operating companies in manufacturing or distribution. Do those weights make sense for a bank? If an analyst had spent just a few minutes thinking about the underlying assumptions of Altman Z; how it relates to the business model of a typical manufacturer and then thought about the business model of a bank; he would instantly have the answer. 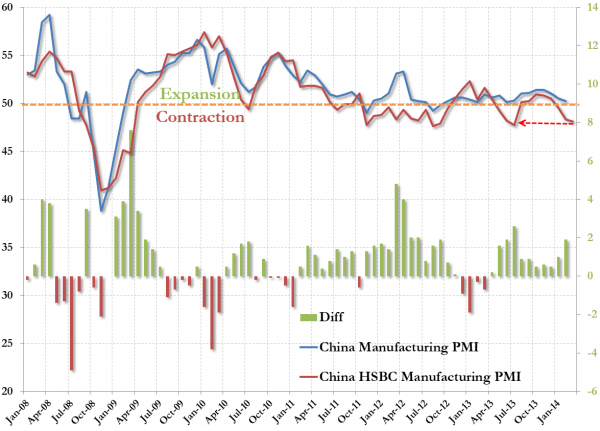 China: Minsky Moment or more stimulus? Over the last 50 years, every investment boom coupled with excessive credit growth has ended in a hard landing, from the Latin American debt crisis of the 1980s, to Japan in 1989, East Asia in 1997, and the United States after both the late-1990s internet bubble and the mid-2000s housing bubble. The lesson is always the same, and it is hard to avoid. Economic miracles are almost always too good to be true. Broad-based, debt-fueled overinvestment (misallocation of capital) may appear to kick economic growth into overdrive for a while; but eventually disappointing returns and consequent selling lead to investment losses, defaults, and banking panics. And in the cases where foreign capital seeking strong growth in already highly valued assets drives the investment boom, the miracle often ends with capital flight and currency collapse. You get the idea of the general tone. Hundreds of people rushed on Tuesday to withdraw money from branches of two small Chinese banks after rumors spread about solvency at one of them, reflecting growing anxiety among investors as regulators signal greater tolerance for credit defaults. Officials at another small bank, Rural Commercial Bank of Huanghai, said they had faced similar rushes by depositors, triggered by rumors of insolvency at Sheyang. "We will be holding an emergency meeting tonight," an official at the bank's administration office told Reuters, but declined to comment further. Hell hath no fury like a woman scorned or, it seems, like a Chinese real estate speculator who is losing money. After four years of talking (and not doing much) about cooling the hot-money speculation that is the Chinese real-estate bubble (mirroring the US equity market bubble since stock-ownership is low in China), the WSJ reports that the people are restless as the PBOC actually takes actions - and prices are falling. With new project prices down over 20%, 'homeowners' exclaim "return our hard-earned money" and "this is very unfair" - who could have seen this coming? Amid growing talk that China may take steps to stimulate a slowing economy soon, the country's vice finance minister told CNBC that Beijing would be careful not to repeat past mistakes. Last week, China's Premier Li Keqiang said the government should roll out measures as soon as possible to stabilize growth and boost domestic demand, China's state news agency Xinhua reported. Vice Finance Minister Zhu Guangyao told CNBC in an exclusive interview on Sunday that authorities would take a cautious approach and was mindful of the negative impact stimulus has had on the economy in the past. Urbanization of China's population has become one of the most important elements in the mainland's shift toward domestic consumption and away from investment-led growth, said Sri Mulyani Indrawati, chief operating officer at the World Bank. "Chinese leaders recognize the inefficiency and (are aiming for) less reliance on investment," she told CNBC from Beijing at the launch of a World Bank report on urbanization. "Urbanization has become one of the most important parts of shifting the growth model," she said. She expects the shift will require a lot of policy adjustment, with reforms needed on land policy, including imposing a property tax to substitute revenue for local governments to provide services for their cities' populations. Local governments have been relying on revenue from selling land to convert it into urban space, she noted. "To maintain [economic] growth at 7.5 percent, [with] better quality and more inclusive, the change is really needed," she said. "They have to change the ecosystem. That is not only going to require the fiscal space, or the ability to finance it, but also the ability to provide those services to many of the migrants moving from the rural to the city area." A report from the FT gives further details on the urbanization plan. How is this different from the same-old-same-old infrastructure spending approach? As part of the planned infrastructure construction, the government plans to ensure that every city in China with more than 200,000 residents will be connected by standard rail and express roads by 2020, while every city with more than 500,000 residents will be accessed by high-speed rail. New airports will be built to ensure that the civil aviation network covers about 90 per cent of China’s population. The plan also calls for the redevelopment of 4.75m household units in rundown shantytowns this year alone, with an expected total cost of Rmb1tn ($163bn), according to state media reports. Over the longer term, China’s leaders want to shift the country’s growth model to make it less infrastructure driven and more reliant on services and consumption, but they insist that they must keep investment levels high in the short term to guarantee employment and political stability. Bottom line: When push comes to shove, employment and political stability trumps everything else. As growth slows and stresses start to appear in the financial system, expect Beijing to unveil another round of stimulus based on credit driven infrastructure spending their urbanization initiative. As well, watch the New China-Old China pair trade and expect it to reverse temporarily in favor of the financials at the expense of the "New China" consumer spending oriented companies. 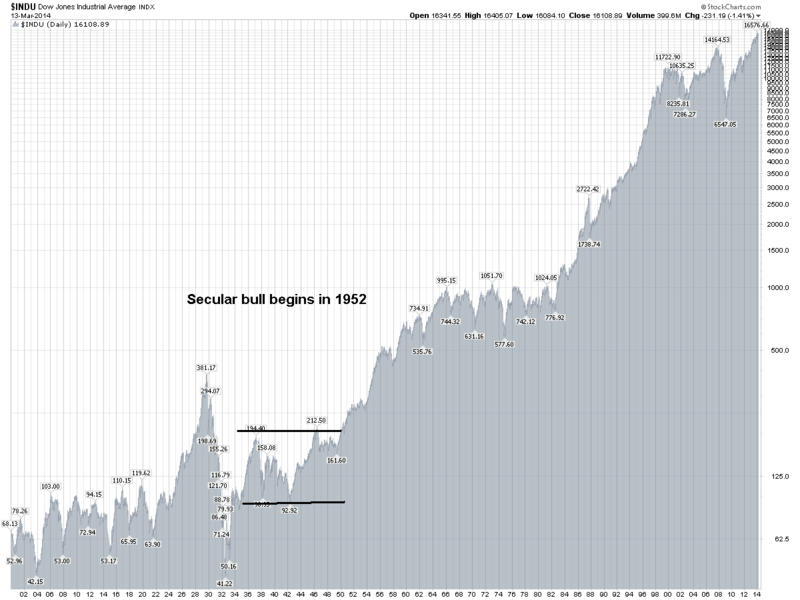 This is another post in the series about the question of whether we are experiencing a brand new secular bull market before (see my previous post New all-time highs = Secular bull?). The struggle I've had is that secular bulls typically don't start at the kinds of elevated valuation levels. Here is a chart of SP 500 P/E ratios from Chart of the Day that goes back to the start of the 20th Century. Note that P/E ratios are at the top of their historical range, especially if we were to exclude the anomalous episodes of the Tech Bubble period and the Lehman Crisis. In short, P/E ratios are elevated today. They aren't stupidly high, but there is no question that they are above average. As another point of reference, James Montier of GMO (via Zero Hedge) believes that the stock market is 50-70% overvalued. A 50-70% adjustment would put the P/E ratio in the low teens - which is roughly in the middle of the historical range. What about interest rates? The inverse of P/E is E/P, or earnings yield, which should be compared to the prevailing interest rates of the time. (This approach, by the way, forms the theoretical basis for the so-called Fed Model.) Here is a chart of 10-year Treasury yields going back to 1918, courtesy of Global Financial Data. The other comparable episode of low bond yields occurred during the period from the late 1930's to the mid-1950's. Here's my problem. The early 1950's were marked by extremely low P/E ratios in the single digit range, while today we are seeing P/Es in the high teens. The early 1950's was marked by a low interest rate regime, just as we have today. If this is truly the start of a new secular bull, how can we expect stock market gains that are typically seen in past episodes? When he puts it all together, my inner investor thinks that, if we are indeed seeing a new secular bull market, the extraordinary measures undertaken by global central banks in the wake of the Lehman Crisis has front-end loaded many of the gains to be realized in this bull. True, the major averages have convincingly broken out to new all-time highs and it looks like a secular bull from a technician's viewpoint. However, valuation analysis suggests that this market is unlikely to see the same kinds of gains. This market isn't a bull. It is, at best, a secular steer. Are Treasuries poised to rally? Fed chairs are under intense scrutiny for their utterances. I can remember an interview with Paul Volcker who said that he felt so much under the microscope that when he went out to a restaurant, he felt compelled to say, "I'll have the steak, but that doesn't mean that I don't like the chicken or the lobster." In the wake of Janet Yellen's uttering the phrase "around six months", both stock and bond markets sold off. While the major equity averages rallied the next day to recover virtually all of their losses, the Treasury market remained mired in the red compared to pre-FOMC announcement levels as of the close on Thursday. So was the market sell-off an overreaction to what amounted to a rookie mistake? Most of the analysis that I've read had a neutral or slightly dovish take to the FOMC statement and Yellen press conference. Here are some examples. 1) When does six months end? 2) Is this data dependent? 3) Is this new news? Based on this schedule, the FOMC will conclude tapering as of January 1, 2015. So six months would be around July 1, 2015. Maybe it surprise some participants, but Yellen's comment fit previously released projections, so it really shouldn't be too shocking. [S]he wanted to emphasise that this too would be data-contingent, not calendar-based. Markets seem to have ignored the caveats. That is the danger of being too explicit when specificity isn’t called for. Bernanke made a similar mistake last summer in saying that “when asset purchases ultimately come to an end, the unemployment rate would likely be in the vicinity of 7 per cent” — only to walk it back shortly after. Don’t be surprised if Yellen also clarifies further what she meant by the “six months” comment, and soon. What she does seem to have done, however, is awaken investors to risks to the interest rate outlook. Since last September investors had become remarkably secure in their belief that the Fed wouldn’t budge on interest rates until mid- to late-2015. The Fed’s many reassurances since September formed and underpinned that conviction. Ms. Yellen and her colleagues have introduced a sliver of uncertainty around the edges of these calculations. Officials still don’t expect to move until next year. They still expect to move rates up very gradually once they start and to keep rates well below normal levels of 4% far into the future. But as they like to remind people from time to time, these decisions aren’t on a preset course. ...we still think that rate hikes are far off. First, we do not think that Yellen meant to send a strong signal of a shift in the reaction function. Second, while we agree that the most likely path for growth is a pickup to a 3%+ pace, the risk to this forecast is on the downside. Third, we expect a more gradual return to 2% inflation than the FOMC. Fourth, we see a significant risk that a tightening of financial conditions in the run-up to the first rate hike will delay the first hike, much as last summer's "taper tantrum" delayed the actual move to QE tapering. Our central forecast for the first hike remains early 2016, although the risks now tilt in the direction of a slightly earlier move. To summarize, the consensus is that the market over-reacted to the downside. 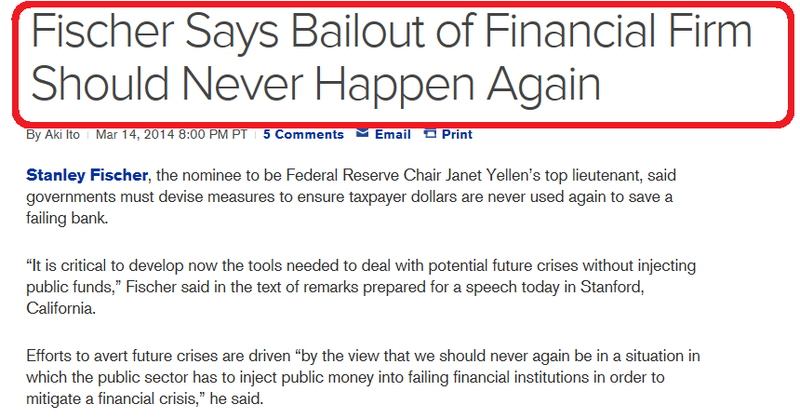 If that's the case, watch for Fed officials scrambling to get into damage control mode in the days and weeks to come. If I am right on that score, watch for the Treasury market to rebound - and soon. "Some of the mainland sellers have liquidity issues - say, their companies in China have some difficulties - so they sold the houses to get cash," said Norton Ng, account manager at a Centaline Property real estate office close to the China border, where luxury houses costing up to HK$30 million ($3.9 million) have been popular with mainland buyers. A golden-haired Tibetan mastiff puppy has reportedly been sold for a whopping $2 million in China, potentially making it the world's most expensive dog. The pup was sold at a premium pet fair in the eastern province of Zhejiang on Tuesday, fetching 12 million yuan ($1.95 million), according to AFP, which cites a report in Chinese newspaper Qianjiang Evening News. "He is a perfect specimen," said Mr Lu, who runs the Tibetan Mastiff Garden in Laoshan, near the eastern Chinese city of Qingdao. "He has excellent genes and will be a good breeding dog. When I started in this business, ten years ago, I never thought we would see such a price." Mr Lu said the details of the sale were confidential, but revealed that the buyer, who paid 10 million yuan (£945,000), was a multi-millionaire coal baron from the north of China. "I could see he loved the puppy, or I would not have sold him," he added. "The buyer told me he thought he was a good investment. 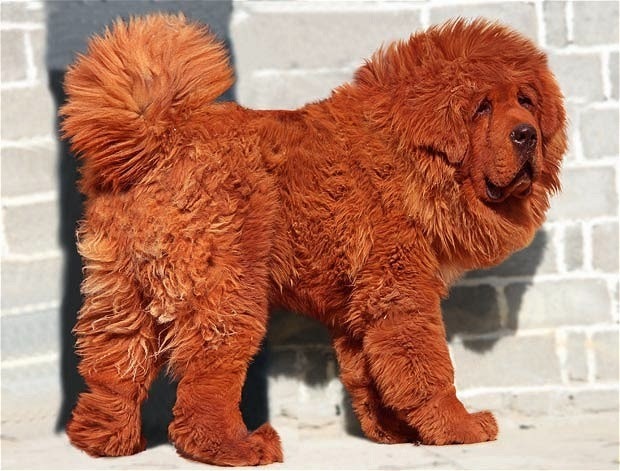 As a male dog, he can be hired out to other breeders for as much as 100,000 yuan a shot. He could recoup his money in just a couple of years." I am glad to see top quality dogs are going up in value, which is an indication of rising affluence in China. £1 million in March 2011 was equivalent to roughly USD 1.6 million at the time. Now a top dog fetches USD 2 million. This shaggy dog story begs the question: If these kinds of prices are being paid for dogs, is China truly crashing from a liquidity crunch? A new direction at the Yellen Fed? Stanley Fischer, the nominee to be Federal Reserve Chair Janet Yellen’s top lieutenant, said governments must devise measures to ensure taxpayer dollars are never used again to save a failing bank. “It is critical to develop now the tools needed to deal with potential future crises without injecting public funds,” Fischer said in the text of remarks prepared for a speech today in Stanford, California. Efforts to avert future crises are driven “by the view that we should never again be in a situation in which the public sector has to inject public money into failing financial institutions in order to mitigate a financial crisis,” he said. Fischer is a former central banker and the breed is normally reserved in their public statements. However, his stature as an elder statesman does allow him some leeway and such views no doubt holds a great deal of sway in the halls of the Federal Reserve. I was always of the opinion that the bankers should never have been bailed out they way they did. The Swedish solution of offering a nationalization solution if a bank could not find private financing was the better solution. At the height of the crisis, the funds allocated to TARP could have bought the equity of the entire BKX Bank Index. While such a change in policy amounts to shutting the barn door after the horse has bolted, it nevertheless amounts to a brand new direction at the Yellen Fed. Suddenly, the nuances of the FOMC statement seems insignificant compared to this development. Wow! Our focus today though is whether China stocks qualify as potential opportunities following their recent correction. It’s our view that these stocks do offer attractive prospective returns. Not outstanding, but attractive. In other words, long-term investors should consider accumulating them at current levels. Yes, China’s economy is deteriorating. I’ve been consistently negative on this economy over the past 18 months. But the argument here is that a credit bust is now largely factored into stock prices. The Chinese stock market is down two-thirds from 2007 highs, investor sentiment is at multi-year lows, valuations are close to decade lows and bank prices have more than discounted a crisis. Sure, there are plenty of risks to this call. Stock market corrections normally end with sharp falls and that may be ahead of us. Events such as further trust loan defaults and a serious property downturn (the next domino to fall) could further dent investor confidence. And the list goes on. Ultimately, however, these risks need to be weighed against the price on offer. In the case of Chinese stocks, the price appears reasonable. The focus of any buying of China stocks should be on what I term “new China”. That is, stocks in sectors which should benefit from the country’s switch to a more consumption-driven economy. The consumer sector is also one to like. While consumer staples are expensive, retailers aren’t. While the latter faces considerable short-term headwinds, some are priced for it. I like Giordano, a pan-Asian discount retailer with significant exposure to China. It has a great track record and sports a single digit price-to-earnings ratio and sustainable dividend yield of +7%. Finally, Chinese insurers operate in an under-penetrated industry which should benefit as incomes improve. PICC has a stronghold on property and casualty insurance and is reasonably priced. Though I am somewhat skeptical of any company in the financial sector because of looming credit, this investment thesis brings up an idea of a pairs trade. How about buying "New China" (consumer sectors) and shorting "Old China" (finance and infrastructure)? The pairs chart tells the story. This pair had been range-bound until PGJ staged a relative breakout against FXI last summer and it has been on a tear ever since. While it is somewhat extended, this is one way to benefit from the stated government objective of rebalancing growth from credit driven infrastructure growth to consumer-led growth. The pairs trade chart shows a high degree of volatility and it is obviously not without risk. However, it may be an interesting way of being exposed to China;s growth with reduced market risk. I will examine each of these issues one by one and conclude this post with a assessment of the technical picture for US equities. In essence, I am trying ask the question, "What could go wrong and how much of it is the market?" President Vladimir Putin is ready and willing to have a confrontation with the West of the scale that would not have been imaginable during the previous 14 years of his presidency. He considers a pro-Western Ukraine to be a strategic challenge to Russia and a likely new member of NATO on Russia's border. Putin no longer trusts Western politicians and seems to have concluded that Russian interests will be taken into account only, if and when it has a strong negotiating position. Putin sees a strong chance of winning in the political confrontation, and this is probably more important for him now than foreign investors. Putin is not interested in an off-ramp right now. We are trying to offer him a face-saving gesture on the basis of our assumption that he wants to save face internationally. But that's wrong. Putin actually sees the ongoing developments in Ukraine as an existential threat. He has carefully calculated the costs and the risks of his steps. Now he is obviously going to wait and see how people react to the outcome of this referendum on Sunday. In a recent statement for a news program, German Foreign Minister Frank-Walter Steinmeier conceded that the EU foreign ministers (himself included) had been too quick during the early days of the crisis to engage with the Ukrainian opposition and too slow to take account of the larger geopolitical issues that are entangled with the crisis. This remark exhibited a level of self-critical reflection and a readiness to adjust to new developments that would have been completely alien to his early twentieth-century counterparts. Today, Western Europe finds itself boxed in. While it remains supportive of the principles of self-determination, it is also cognizant of Russia's perceived needs of the security of its borders (the Russian Monroe Doctrine). The question then becomes one of how the West and Russia can each save face and achieve their respective objectives without appearing to back down? Strictly from a coldly logical position (and I am not advocating this, I should add), in many ways it is in Kyiv’s interests for Moscow to steal Crimea, and turn it into some pseudo-state or new part of the Russian Federation. Ukraine loses a sunny peninsula, but also a distinct drain on the state’s coffers (the Crimean economy is not great, and the region receives net subsidies from the centre). It sheds the most troublesome and Russophile of its regions, one which has been a turbulent locus of trouble for Kyiv for most of post-Soviet Ukraine’s history. It also gets concrete proof of the threat it faces from Russian bullying and probably accelerated and solicitous assistance from the US, EU, NATO, etc. It also validates every Ukrainian fear about Russia. Ever since Ukraine became a sovereign nation in 1991, Crimea has received more subsidies from the central government than it pays in taxes, and that would probably continue on Moscow’s tab. Russian levels of social spending are higher than Ukraine’s, and economists predict that Moscow may have to pay about $3 billion a year to support the region. On Friday, Russia committed to at least $1 billion for the upcoming year, even without annexation. Crimea receives nearly all its electricity and drinking water from Ukraine, and Russia will need to build new infrastructure — including a long-planned bridge — to link Crimea directly to the Russian mainland. Until that is complete, it will have to pay Ukraine for the utilities. An analysis done by Russia’s Moskovsky Komsomolets newspaper suggested that absorbing Crimea might cost Russia $20 billion during the next three years. “We have a joke here: Who wins if Crimea becomes part of Russia? The pensioners, the civil servants and the military. Who loses? The creative class, the middle class,” Mr. Kostinsky sighs. Bulls and bears alike should decide for themselves what has already been priced by the market. They should also heed Oleg Babinov's advice to see the extent of Western sanctions and Moscow's response in the days and weeks to come. The second major worry for investors has been the rising prospect for an economic slowdown in China. Slowing growth would expose the Chinese financial system to rising levels of tail-risk. The press has been full of stories about a Chinese slowdown and I won't go through all of them. This Financial Post is story entitled 11 ugly signs confirming China's dramatic slowdown is an excellent example. Speaking at a news conference in Beijing on Thursday, Premier Li Keqiang said that job growth and quality-of-life issues like the battle to reduce air pollution took precedence over the headline growth figure. China needs to create 10 million jobs, he added. He also said that further bond defaults were inevitable, as China remakes its financial system and rules. But he added that the government would do its best to ensure that bad debt did not roil the broader system. In some ways, the current market turmoil over potential defaults represents a health adjustment as China is moving towards market signals to properly price risk. Bloomberg reported that Chinese default risk has risen beyond Ireland's. Indeed, the pricing of my so-called Chinese canaries, or Chinese banks listed in HK, has seen a bifurcated path. While the an index of smaller banks have fallen to a critical support zone, which indicate some degree of caution is required, the index of the Big Four state owned banks remain relatively healthy compared to their own history. When I put it all together, it appears that Beijing is trying to reform policies so that market forces become more dominant, but not so dominant that it would allow a disorderly market unwind. It has therefore implicitly signaled that a "Beijing Put" is in place for the markets. Lastly, falling Street EPS estimates in the past few weeks have been a headwind for stock prices. The recent weakness in macro-economic indicators have fed through to falling Street estimates. Fortunately for the bulls, the bout of weakness in high-frequency economic releases may have been overdone. 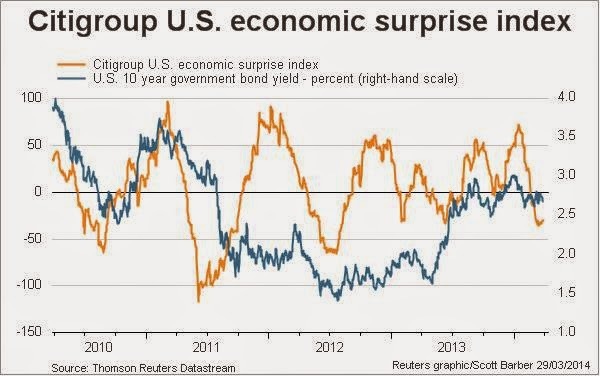 The chart below of the Citigroup Economic Surprise Index (in orange) has retreated to levels where it has rebounded in the past. If you are taking a bearish view on equities, then you are not just betting that the economic acceleration embraced as the market consensus in late 2013 was a false dawn, but that economic growth is actually starting to decelerate below 2%. This week is a continuation of the last few week's trends. Last year's weakness in the long leading indicators has fed through into the short leading and coincident indicators, although there was improvement in many this week. Because the recent weak consumer spending leads jobs, I expect that job reports in the next several months may be weak. At the same time, the long leading indicators did not roll over and have recently rebounded somewhat and suggest this will not lead to actual contraction. More importantly, the year-over-year growth rate of the 4-quarter estimate rose to 6.19%, from 6.11% last week and 6.05% two weeks ago. 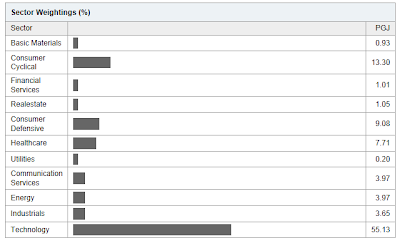 In my opinion it needs to move over 8% to start to think we can see 10% growth in 2014. So far, so good, on the EPS growth outlook. Corporate insiders are more bearish than they have been in almost 25 years. That isn’t good news for the stock market, since these insiders — corporate officers and directors— know more about their companies’ prospects than the rest of us. The high level of insider selling is a concern and something to keep on your radar, but insider buying has historically been a more powerful signal than insider selling. Indeed, the last time Hulbert sounded the alarm on insider selling was in December 2012, just before the stock market continue to rally to further recovery highs. 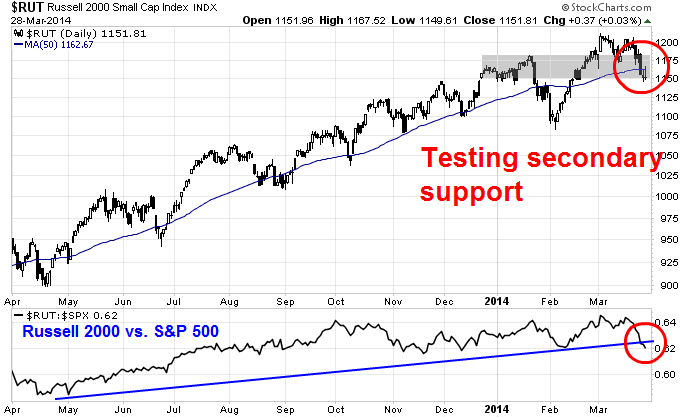 To finish my review, I conclude with a technical market assessment of the US equity market. The SPX has fallen, but it has descended to a level where there is ample technical support, such as the 50 day moving average at about 1128 level. 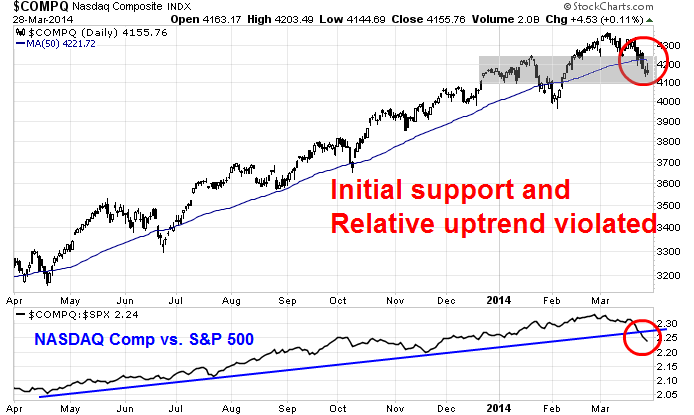 The advance-decline line remains in an uptrend, though it did violate a support level. Other breadth measures remain constructive. I constructed an equal weighted composite of the relative performance of the Russell 2000, the SP 600 and the equal weighted SP 500 against the SP 500 as a broad measure of the small cap vs. large cap breadth. Small cap stocks remain in a relative uptrend against large caps that began in mid-2012. Moreover, they recently staged an upside relative breakout and that breakout has held up. 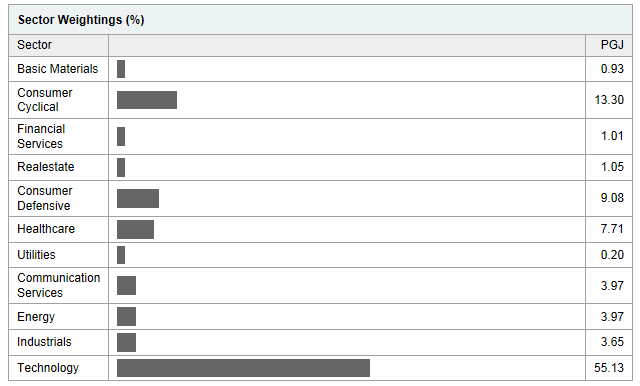 As well, the map of market leadership remains in the bulls' favor. The chart below shows the relative performance of the defensive sectors (in black), which consist of consumer staples, utilities and telecom (health care was not included as sector performance has been skewed by the biotechs, which have been on a tear) against the SP 500. The SP 500 performance is shown for reference in purple. Note how past market tops have been preceded or coincidental with the outperformance of defensive stocks. Today, while defensive stocks have ticked up a bit, they remain in a relative downtrend. In the short-term, the market is oversold and the risk is tilted to the upside. This depiction of the equity-only put-call ratio (blue=5 day moving average, red=21 dma) is a contrarian indicator. It shows that short-term option trader sentiment is at or near a crowded short reading and medium term sentiment to be roughly neutral. What bet are you making? To summarize, bulls and bears have to understand the nature of the bet that they are making if they take a directional bias in the current market environment. Equity markets have taken a hit mainly on worries over Ukraine/Crimea and China. The fear level is a tad on the high side, which doesn't mean that they can't get even higher on negative developments. I believe that China fears are overblown for the reasons that I already cited, but the geopolitical situation with the Crimea is a wildcard. Longer term, the outlook for equities appear benign as positive breadth and rising EPS expectations are supportive of higher stock prices. Bearish traders have to know that if they get short or remain short here, they are betting mainly on geopolitical tensions getting out of control. In effect, they are betting that the world is on the edge of a precipice and it's ready to go over. In addition, they are betting on a neutral or hawkish statement from an FOMC meeting on March 19 from a Fed headed by a new chair with a dovish reputation. By contrast, bulls are betting that someone in Moscow, Washington, Berlin, etc. doesn't miscalculate and deepen the crisis. The bulls' underlying view is that the stock market just hit a pothole, but it's not going to slide over a cliff. Traders have to decide, in effect, on what kind of bear they encountered last week. The events of 9/11 exposed a vulnerability of the Air Traffic Control (ATC) system. ATC could not track one of the hijacked airliners among the myriad of planes in the air because it had turned off its transponder. That episode begged the question, "If Russian Backfire bombers approached the US coast and was preparing to fire cruise missiles at Washington, did NORAD expect the Backfires to be transmitting transponder signals?" The disappearance of MH370 exposed another flaw in global ATC. When an aircraft is in international airspace over the ocean, they are not under the control of any country's ATC system. Airliners, however, do fly commonly specified routes at specified altitudes as then cross the ocean. When they enter a country's airspace, they then check in with local ATC, who then guides them. A group of terrorists hijack an airliner, turn off its transponder and other communication systems, and spirit the plane to places unknown. The plane lands and it is re-loaded with high explosives, which makes it an even more powerful bomb than the hijacked 9/11 planes. The plane takes off again and blends into traffic on an international route. When it approaches the airspace of the target country, it identifies itself as a fictitious flight. The pilots then flies into its target and the flying bomb wreaks havoc on whatever it hits. Given its likely direction of flight, which is currently postulated in a westward direction from Malaysia, a likely target under this scenario would be a oil facility in the Middle East. Imagine a flying bomb crashing into a large refining or oil export facility and taking out a significant portion of global production and you get the idea of the global impact of such an act. There are enough skilled, dedicated and well-trained volunteers to hijack and take over an airliner (step 1 as postulated by New Deal Democrat). An accomplice to file a false flight plan for the plane on its flight. ATC generally knows the schedules of airliners coming into its airspace and the appearance of an unknown plane with unusual call signs would set off warnings. Such an operation would require a high level of planning and coordination. It's very difficult to just land a 777 somewhere out of the blue, hope that it won't be noticed by somebody and refuel it without detection. Any state that allows its facility to be used for such an operation would be branded a sponsor of terrorism and suffer the consequences. What's more, what are the chances that an organization, however nefarious, could pull off such an operation involving so many people without arousing the suspicion of one or more intelligence services? The disappearance of MH370 remains a mystery, but I suppose that such a scenario could be the inspiration for a book or screenplay. The price of copper and other cyclically sensitive industrial commodities have cratered in response. In addition, selling pressure may have been partly caused by an unwinding of the carry trade in these metals (see this FT Alphaville post for a discussion of the copper carry trade). FXI, the Chinese equity ETF, has been in a downtrend and breached an important short-term technical support level. What's going on? Is this time to start shorting China and China-related plays? Beijing has exhibited a pattern of pushing a reform agenda, but unwilling to bite the bullet when critical sectors of the economy get pushed to the edge. If history is any guide, the Chinese leadership will continue talking tough on reform, only to see its initiatives get watered down as they run up against entrenched interests. "We are reluctant to see defaults of financial products, but some cases are hard to avoid," Li said. "We must enhance oversight and solve problems in a timely way to ensure no systemic and regional risks." You have to read between the lines and understand what was not said. They don't like to see defaults of trust and wealth management products, but Li did not say outright that they would allow all shadow banking products go bust, let market forces assert themselves and eliminate the moral hazard problem. Instead, Li said in so many words that they will take steps to "ensure no systemic and regional risks". In other words, count on more bailouts and stimulus. Based on Li Keqiang's recent statement, it appears more than likely that the Chinese leadership will blink one more time to play the "extend and pretend" game. Expect them to once more stimulate and rescue the economy should growth slow or financial stresses threaten stability. Hong Kong stocks fell and copper extended declines following the data, which came two hours after Premier Li Keqiang indicated he was confident the nation would meet what he said was a flexible growth target of “about” 7.5 percent. The slowdown may test the Communist Party’s commitment to give market forces a bigger role in the world’s second-largest economy while confronting overcapacity, debt and pollution. Such a reduction could happen “within a few days” if the government wants to achieve 7.5 percent expansion, Yao said. So -- what do we make of this weakness? Part of it is probably due to the seasonal impact of Chinese New Year's celebration. For the last three years, early year Chinese data has had similar misses but later rebounded. At the same time, many people have noted that as China tries to rebalance its economy, these type of misses may become more pronounced and numerous. 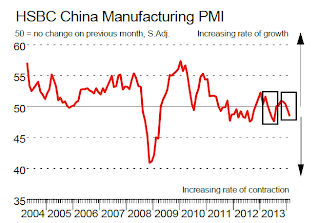 But also note China is still growing at a sharp clip. And even if we see the number dip to the 6% range that's hardly a reason to throw in the towel. While it would be disappointing, it would also be a signal the Chinese economy is beginning to mature and achieve first world status. I have seen some China bears embrace the idea of short positions in Australian miners and base metals in light of recent copper weakness, but the forecast of an extended decline in mining stocks may be a mirage. If copper is so weak, why is the relative performance of mining stocks against the SPX still range-bound? Another key indicator of China weakness to watch is the AUDCAD exchange rate. Both Australia and Canada are resource producing economies, but Australia is more China sensitive and Canada is more US-sensitive. China bears should ask themselves why the AUDCAD exchange rate is in an uptrend in light of the recent weakness in Chinese economic data. 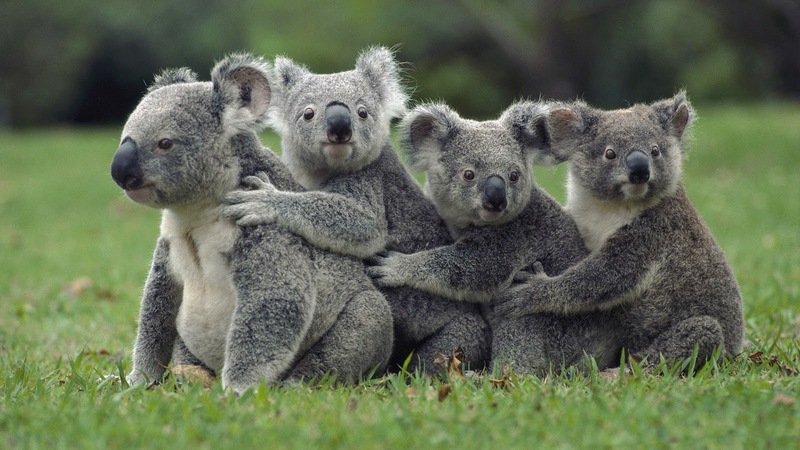 For China bears, a word of advice: "Just be sure that the grizzly bear that you are chasing doesn't turn out to be a koala bear." New all-time highs = Secular bull market? What fundamentals drove the equity rally?